Marshall J Brown Co is a respected industrial basket strainer supplier providing quality basket strainers for a wide range of industries. See our industries page for more information! We offer duplex basket strainers as well as simplex basket strainers. Our industrial basket strainers are crucial in maintaining any piping system as it provides protection of the pump, compressor, meter and other vital components. These basket strainers are designed to resist harsh industrial chemicals, see more on FRP strainers. At Marshall J Brown Co, we strive to provide commercial basket strainers of sound mechanical integrity and performance. 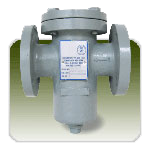 We will supply standard or custom strainers of any size or material to meet your order and application. We also offer a variety of other industrial strainers.